Eating clean with a family at home doesn’t have to mean a fight at the dinner table. You can get the whole family on board with a fitness plan, even backing it up with healthy meals at home, and nobody will be the wiser. Simply swap out a few of traditional ingredients for clean alternatives, and you’ve got yourself a clean meals your entire family will enjoy. Sometimes you just need a tuna salad sandwich. Mix a little bit of dijon mustard with some greek yogurt and you’ve got a mayonnaise substitute that will satisfy even your most discerning critics. There’s a time and place for bread, but when you are eating clean, less bread means more lean muscle. Next time you’re in the mood for a crunchy finger lickin’ treat, try a pecan crusted chicken breast. Loaded with vitamins A, B, and E, pecans are also an excellent source of antioxidants, and make a tasty, crunchy coating for chicken tenders, legs, and breasts. Sweet potatoes rule. Other potatoes drool. Anytime you can make the switch from regular old yukon or white potatoes to sweet potatoes, do it. 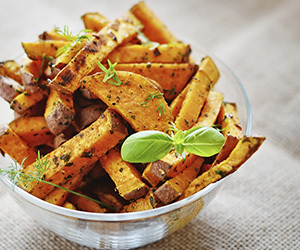 The humble sweet potatoes is one of the most nutrient dense, delicious, clean eating foods you can consume, and it has a surprisingly low glycemic load, meaning it doesn’t impact blood sugar levels much. This means less fat storage, and more clean healthy energy for your family. Stevia is a great substitute for white sugar. Available in both liquid and powdered form, stevia is much sweeter than granulated white sugar. It doesn’t have any calories or sugars, and doesn’t impact insulin in the blood stream. Add it to drinks, baked goods, and breakfast items to turn your favorite foods into clean sweet treats. Super star and protein powerhouse greek yogurt makes another appearance on our list as a pinch hitter for sour cream. While the texture is ever-so-slightly different on its own, you can’t tell the difference in recipes, and it makes a perfect substitute for the creamy center base of chicken enchiladas. A few ingredient changes in the kitchen can make a world of difference in your waistline, and your energy levels too. Your favorite recipes will still taste delicious, but will serve you better, and give you more energy for your workouts, your family, and your life.